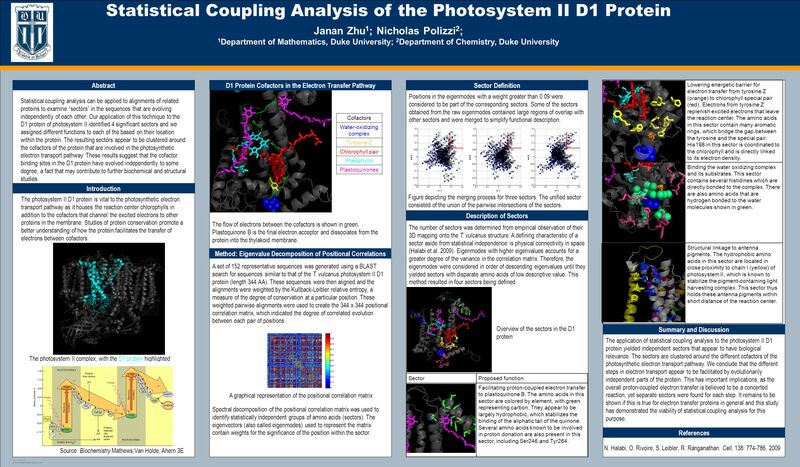 TEMPLATE DESIGN © 2008 www.PosterPresentations.com Statistical Coupling Analysis of the Photosystem II D1 Protein Janan Zhu 1 ; Nicholas Polizzi 2 ; 1. Download ppt "TEMPLATE DESIGN © 2008 www.PosterPresentations.com Statistical Coupling Analysis of the Photosystem II D1 Protein Janan Zhu 1 ; Nicholas Polizzi 2 ; 1." An Overview of Photosynthesis Most of the energy used by almost all living cells ultimately comes from the sun  plants, algae, and some bacteria capture. Photosynthesis in plants Light energy is used to transform carbon dioxide and water to energy rich food molecules composed of glucose monomers There are. Chapter 15 (part1) Photosynthesis. Implications of Photosynthesis on Evolution. THE LIGHT DEPENDENT REACTION. OXIDATION AND REDUCTION Oxidation Is a Loss of electrons (OIL) Reduction Is a Gain of electrons (RIG) © 2010 Paul Billiet. Photosynthesis: The Hill Reaction. Announcements -There is a quiz next week that will cover Fermentation and Photosynthesis. -home work is posted on my. Photosynthesis is the process a plant uses to make food and grow. Raven - Johnson - Biology: 6th Ed. - All Rights Reserved - McGraw Hill Companies Photosynthesis Light Reaction (AP) Chapter 10. THE LIGHT REACTIONS.  Begin when photons strike the photosynthetic membrane. The process can be divided into three parts. 1) Photoexcitation: absorption. WHY ARE PLANTS GREEN? It's not that easy bein' green Having to spend each day the color of the leaves When I think it could be nicer being red or yellow. Photosynthesis Photosynthesis is the process of converting light energy to chemical energy. Plants, algae, cyanobacteria, and some protists produce organic. Where does the energy that living things need come from? Food! You’re not you when you’re hungry! Forms of stored energy in cells Electrochemical gradients Covalent bonds (ATP) Reducing power (NADH) During photosynthesis, respiration and glycolysis. Light Dependent Reactions IB Topic 8.2.3: Explain the light dependent reactions. Chapter 14 Energy Generation in Mitochondria and Chloroplasts.